I saw that the Song of Blades and Heroes rules recently released a French and Indian War version, Songs of Guns and Tomahawks. For years I've been patiently waiting for Imex to release their 1/72 Rogers Rangers set, but it looks like that's never going to happen. BUM has several French and Indian War sets, but they are super expensive by typical 1/72 standards. Waterloo does have a Rogers Rangers set, but the models aren't very accurate, historically speaking. So! I realized I could build my own rangers using sets that I already have. In the front row I'm using some of Italeri's excellent Indian Warriors. The two on the right are remaining as British allied Indians. On the left I made simple Scotch bonnets to turn them into rangers in Indian garb. The brown models in the middle row are Red Box British Infantry. These models are intended for the Jacobite Rebellion, but that's only a decade before the Seven Years War (so the uniforms work well). I added another bonnet to one, and I trimmed away the brim of one of the tricorn hats to make a jockey style cap. 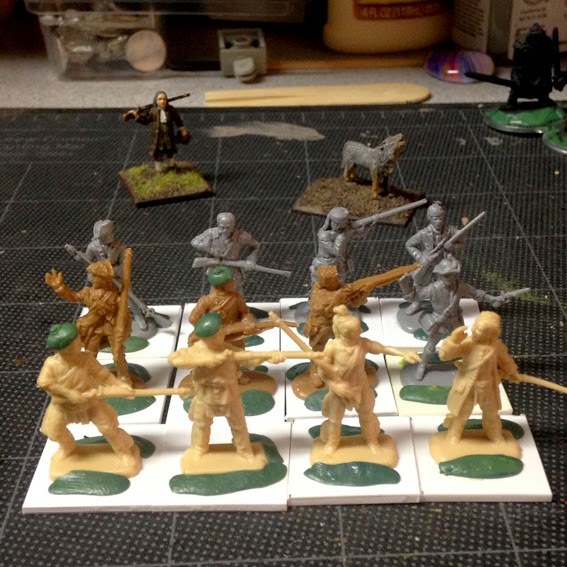 And in the back row I'm using grey figures from the Revell/Accurate American Militia set. I'd love to have a 1/72 scale wolf to accompany these guys (Rogers had a wolf-dog that would accompany them on raids). Unfortunately, I can't find anything suitable. My 25mm wolf in the background is way too big. And the dog that comes with Imex's Eastern Friendly Indians is too small. P.S. That's my Ben Franklin in the background. He's also from the American Militia set. Perhaps you could use a German shepperd from the Revell WW1 German set as a wolf hound? The mini's look great!